Whoever you are come forth / Kate Moore. The title derived from Song of the Open Road by Walt Whitman, is based on the syllable structure of the poem beginning with the line "Whoever you are come forth". Originally commissioned by The Korzo Theater as part of the Open Road Cycle and arranged for solo cello for the album Stories for Ocean Shells. Score [ePDF]: Whoever you are come forth : [eScore] / Kate Moore. 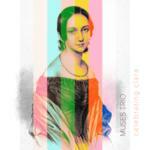 CD: Celebrating Clara / Muses Trio.